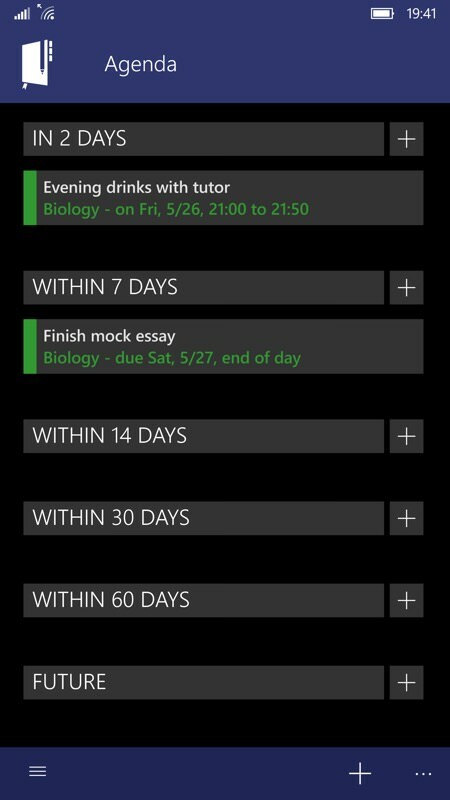 It's easy to tell a labour of love when you see it - and Power Planner (UWP) has been crafted to within an inch of its life, all within the Windows 10 environment. 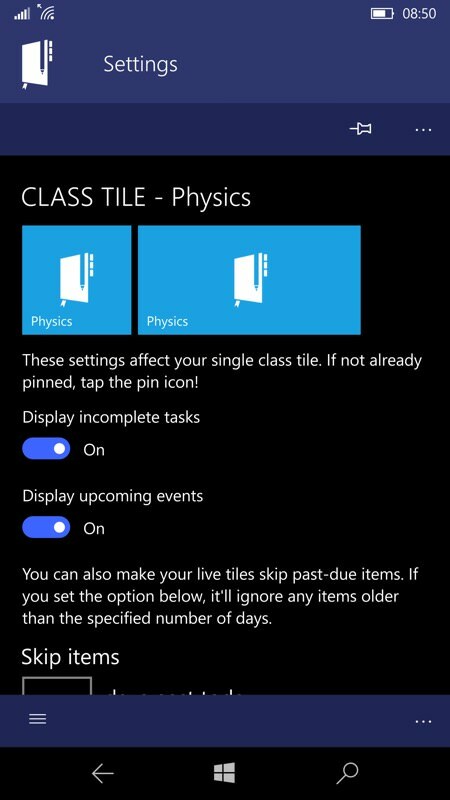 The idea is that a student has this on their Windows 10 Mobile phone, on their (W10) tablet and, potentially on their (W10) laptop too - and all their classes, scheduled items and notes get synced seamlessly. Never miss a class again, etc. And, with the caveat that everything here is American (so 'semesters' and "GPAs'), it all works as advertised. 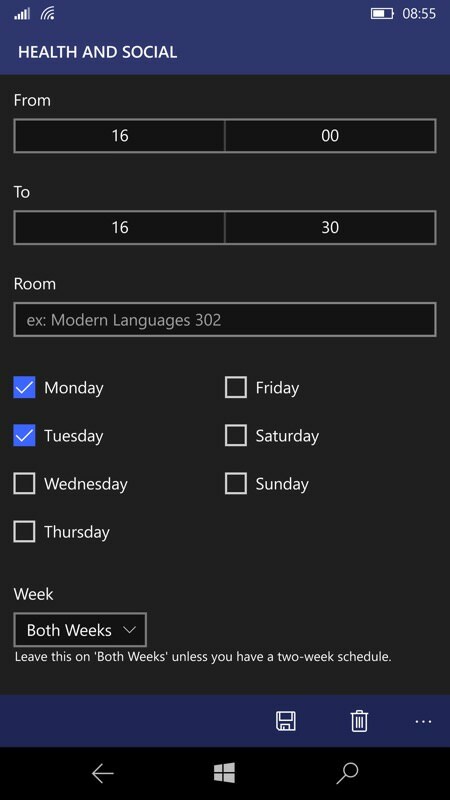 Add terms, classes, scheduled periods, extra meet-ups and appointments (e.g. 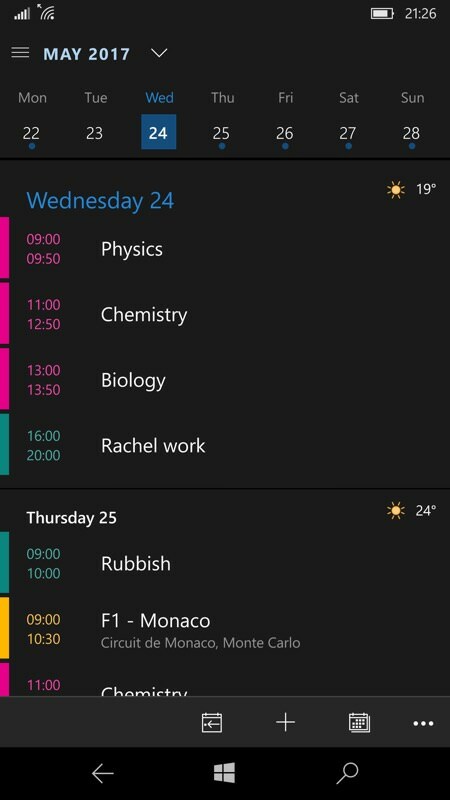 tutorials), whatever you like, and Power Planner UWP keeps track and keeps you organised. Having said that this is Windows 10 UWP application, it does break a few of the rules, not least that a 'back' control press from any of the main modules dumps you back to the Windows 10 Mobile Start screen. Don't worry, Power Planner is still running, this is just an idiosyncrasy - I'd have MUCH preferred that pressing 'back' would at the very least bring up an 'Are you sure?' prompt and ideally would just pop up the (unusually, at lower left) hamburger menu. Oh well, something for the developer to add in - he's very active. 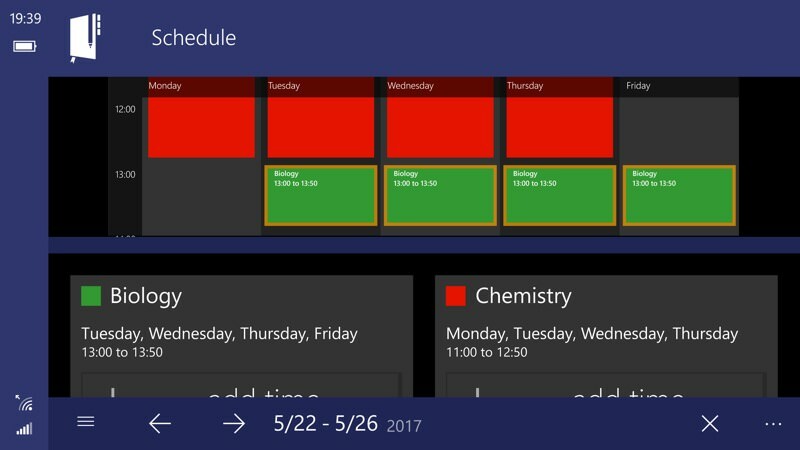 As with a lot of UWP applications, Power Planner runs perfectly in landscape from a technical standpoint (as it also would do on Continuum or on a tablet/hybrid/laptop), but the layout is compromised slightly by the physical screen size. So for the rest of the review it's all in portrait mode on the phone here. 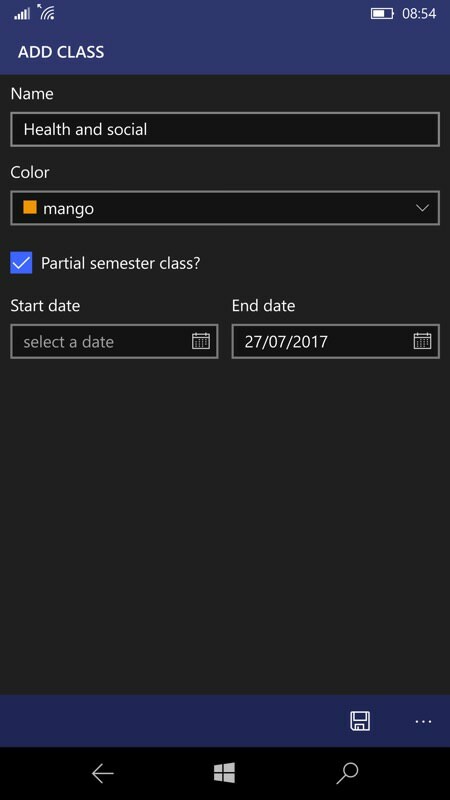 New classes are automatically assigned a new colour code and then it's just a question of setting up the timings/days, with even the (common) possibility of A and B week schedules allowed for. An Agenda view shows things which are upcoming (other than classes) - so homework deadlines, exams, extra appointments, and so on; (right) the USA Grade Point Average system is used and calculated here, according to the gradeable work you finish. I guess you could adapt this for non-USA use, but it would be nice if there were some 'world'/European settings available too. 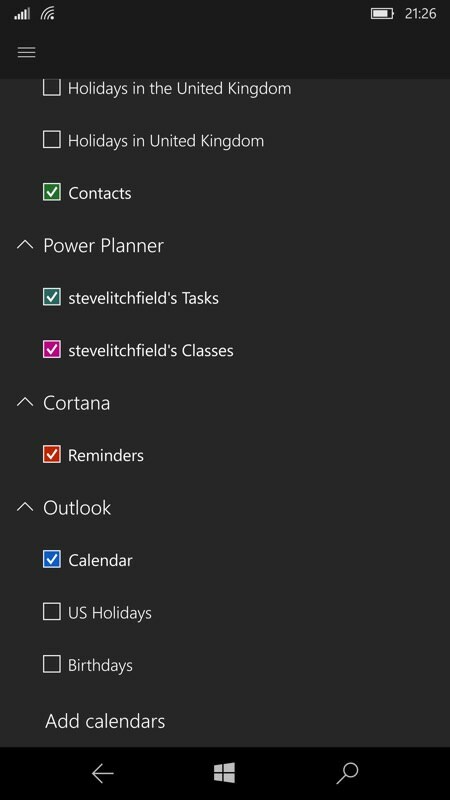 As advertised, Power Planner also pokes its schedule (if requested) into Outlook Calendar, here under 'Tasks' and 'Classes' calendars, showing up in my usual Outlook agenda view (left). 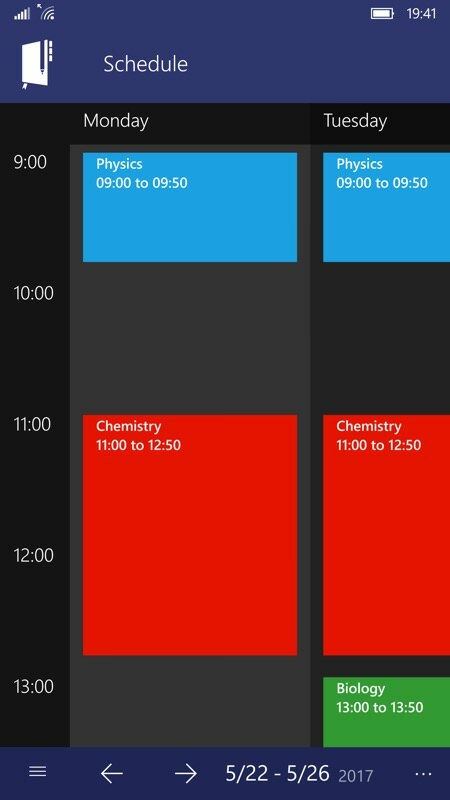 A good way to make sure that you don't miss a class! 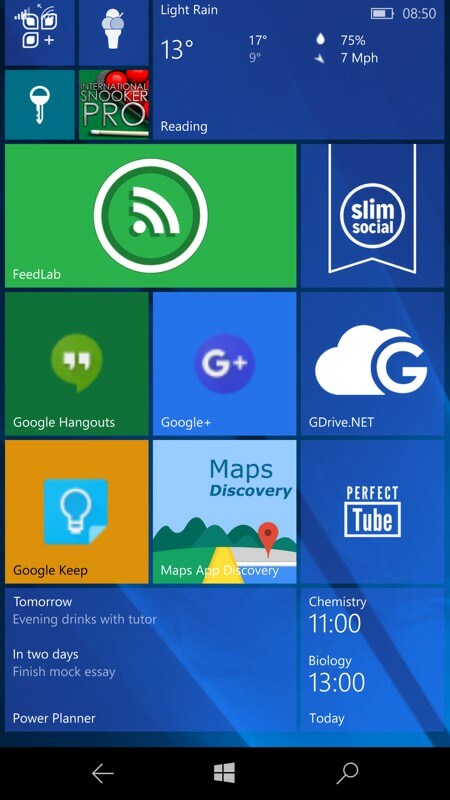 Live tiles are a big feature here - amazingly configurable and well thought out. You can pin your agenda, your classes, and much more. 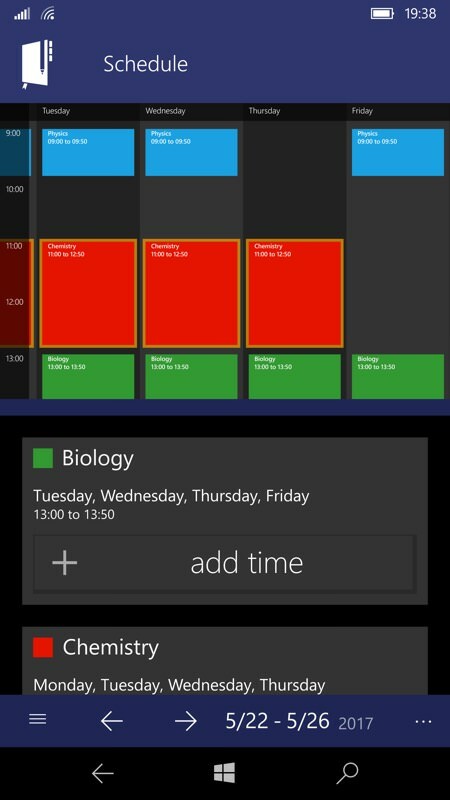 In theory, you could have half a page of Start screen loaded up with Power Planner live tiles, though I've been restrained above, right, with just two tiles. 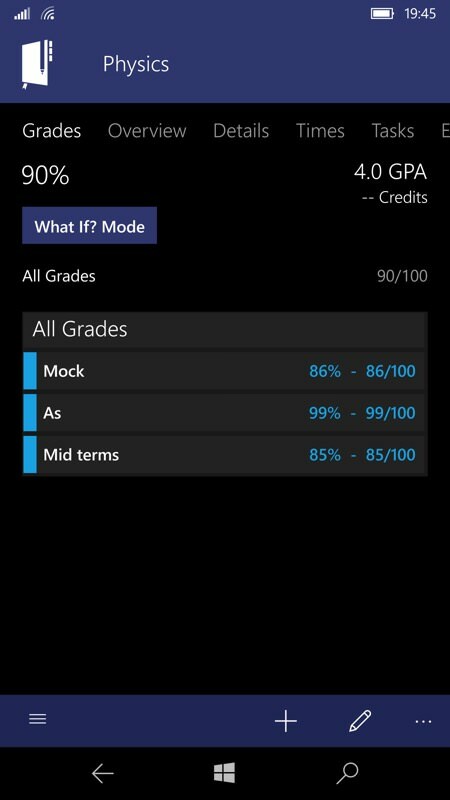 A beautifully focussed and attractively programmed UWP application for students (or teachers, potentially?!) and with only a few idiosyncrasies and rough edges. Highly recommended if you have need to track any of this information.